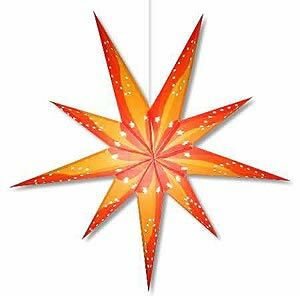 "9 Point Big Tahiti Sun Star Lamp"
This is a big 24 inch star lamp made with sturdy paper. This is a 9 point star lamp and looks great lit at night. This big star demands attention and looks very cool. This star has 9 uneven points. you can also gives this star a richer look by using a colored light bulb in it.